While simulated spooky fare in movies may get a big boost from devilishly applied special effects, animated horror has the advantage of the unlimited possibilities of moving closer to the imaginary terrors that reside inside our heads. 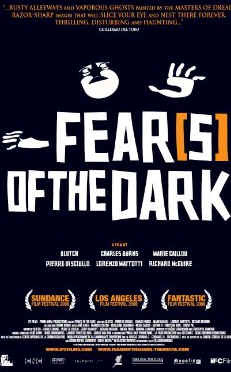 And Fear(s) Of The Dark, an international collection of six stories by ten animation artists, and arriving just in time for Halloween, digs deep into the scariest recesses of the mind, but with mixed results. The somber vignettes are connected by several intertwining narrative threads that course through the other stories, but more with their own internal logic than any contributing clarity or impact on the production as a whole. One is quite an effective historically metaphorical macabre Blutch creation, featuring what seems like a French Revolutionary era aristocrat walking a pack of unruly attack dogs, which he gleefully lets loose on the common people one by one. The other is Pierre Di Sciullo’s abstract twirling graphic collage accompanied by a female voiceover, and addressing more psychological but no less troubling torments in the real world in present times, including fear of mankind, of war, and political fears, not to mention the dread of one’s assigned identity as ‘unredeemingly bourgeois’ and its connection to ‘being scared of never being useful.’ That personal dread as absence defined in terms of the negative, and the emptiness of existence, is an intriguing addition to the notion of deep-seated human horror. While some of the vignettes are far more whimsical than scary when not merely stagnant in nature, the more conventionally crafted tale by Charles Burns stands out as most chilling, both for its eerie and taut storytelling, and the fact that the ill-fated protagonist is voiced by actor Guillaume Depardieu, the young son of French screen legend Gerard Depardieu, who in a real life horror that casts a shadow of its own over this production, died suddenly and tragically last week, succumbing to pneumonia. Depardieu is the solemn voice of a withdrawn young French college student, who in a highly creepy twist of fate, is imprisoned by a pet insect he kept in a bottle as a child, and who takes power over his now human plaything, through the persona of a suspiciously far too horny college coed.